2018 witnessed many world economic upheavals. Trade wars among great economic powers directly impacted economies and business operations. Overcoming difficulties and challenges, Sao Mai Group still managed to have a very successful year of 2018 and opened up many development prospects in the following years. Vietnam Business Forum Magazine highlighted 10 most remarkable events of Sao Mai Group in 2018. Whenever Tet comes, Sao Mai Group launches the “Sao Mai Group shares Tet with the poor” program. 2018 was the fifth straight year Sao Mai Group carried out this humanistic program. The 2018 Program was carried out by Sao Mai Group from January 31, 2018 to February 11, 2018 with nearly 5,000 gifts worth over VND3 billion shared with the poor. Representatives of Sao Mai Group and local officers presented gifts to the poor, disadvantaged people, Agent Orange victims, lonely elderly and orphaned children in An Giang, Dong Thap, Can Tho, Kien Giang and Thanh Hoa provinces. In an effort to increase the added value of Vietnamese pangasius, in March 2018, Sao Mai Group and the Research Institute of Marine Fisheries signed a cooperation agreement on technology transfer for production of value-added pangasius products. Accordingly based on the cooperation agreement between the Research Institute of Marine Fisheries (RIMF) and the International Investment & Development Corporation (Sao Mai-IDI) signed in 2017, the two sides advanced a longer step in bilateral comprehensive cooperation by signing an agreement on production technology transfer of value-added pangasius products.” The 5-year cooperation deal aimed to create absolute competitive advantages for Vietnamese pangasius, bring high economic efficiency to enterprises, farmers, agriculture and economy as a whole. Sao Mai - Dong Thap Hotel was inaugurated by Sao Mai Group on April 9, 2018 after a VND200 billion investment and upgrading package. Sao Mai - Dong Thap Hotel, located at 178 Nguyen Hue Street, Ward 2, Cao Lanh City, Dong Thap Province, features a blend of modern and classic European architecture. The hotel has a total floor area of ​​up to 79,000 square meters, including 5 floors and 62 rooms classified into Standard, Superior and Deluxe. The highest-class is President Suite furnished with extremely luxurious amenities. Sao Mai - Dong Thap Hotel is also an international conference center capable of accommodating up to 1,000 guests. This facility is scientifically designed, equipped with specialized equipment and served by professional employees. In June 2018, Sao Mai Group managed to create a bold breakthrough to start a “revolution” for breeding quality pangasius stock from the first stage by cooperating with the Research Institute for Fishery Production Technology (Israel) to build the Research Center for High-tech Aquatic Stocks. On June 11-14, Sao Mai Group sent professional officers and Israeli research experts to conduct field surveys in the Mekong Delta to assess the whole pangasius production and breeding process in Vietnam. This is a very important database for two sides to work together to research and improve the quality of fingerlings and hybrids to reproduce F1, F2 and F3 stocks for farmers in the Mekong Delta and in the whole country in general. The center establishment aimed to upgrade quality and invest breeding livestocks. This is an important linkage for Sao Mai Group to complete its mission of closing the Vietnamese pangasius value chain. In July 2018, Sao Mai Group launched International Financial and Media Investment Joint Stock Company (MIF), opened the electronic information portal saomainews.com and held the opening ceremony for the K2N Japan Internship from which workers in the Mekong Delta and in Vietnam can have the chance to change their life. Besides, they have the chance to access to the professional working environment. Over the years, Sao Mai Group has established good relationships with strategic partners from Japan, Taiwan, South Korea and some European countries, mostly large-scale economic corporations engaged in processing and exporting agricultural and aquatic products, solar energy and financial investment. This is the reason why Sao Mai Group continues to expand labor supply business. MIF - a member of Sao Mai Group - will undertake internship programs in developed economies. The introduction of MIF will help re-establish the market order of sending Vietnamese workers to work abroad. In July 2018, Nhut Hong Joint Stock Company - a member of Sao Mai Group - organized the Customer Day and held a lucky draw for land buyers in Nhut Hong Urban Area project. The prize value was more than VND2 billion. Besides, the company launched the incentive program “Buy Nhut Hong land - Win gold”. Nhut Hong Urban Area is the most advanced residence in Ca Mau invested by Sao Mai Group. In the first phase, Sao Mai invested in a modern and synchronous arterial transportation network with neighboring areas, internal roads, National Highway 1A, communication network, electricity, water and public lighting services for the whole area. Nhut Hong Joint Stock Company - the operator of the urban area - has completed the entire technical infrastructure and social infrastructure ready to welcome the first residents to settle. 7. Workshop on "Sao Mai Super Feed: Smart Choice"
The Workshop on Sao Mai Super Feed was organized by Sao Mai Group in August 2018 in order to introduce Sao Mai Super Feed seafood products. Sao Mai Super Feed is produced on a fully automatic, self-contained chain from the loading system to packing finished products. Sao Mai Super Feed has the most modern technology in Europe and the United States and a team of highly qualified engineers. The factory is operated according to international standards such as HACCP, ISO, GLOBAL GAP, ASC and BAP, thus all its products can satisfy all requirements from demanding markets like the EU and the United States. In September 2018, in Hanoi, Sao Mai Group held a ceremony to sign a power purchase agreement with Electricity of Vietnam Group (EVN). Accordingly, the Sao Mai Group’s solar power plant will supply clean electricity to EVN and the electricity pricing is based on regulations in Clause 1, Article 12, Decision 11/2017/QD-TTg dated April 11, 2017 of the Prime Minister. Specifically, EVN will buy electricity at the electricity delivery point for VND2,086 per kWh and apply in 20 years from the date of commercial operation. Costing VND10 trillion of investment capital with four-stage phase-outs, this 210-MW solar power plant is one of Southeast Asia's largest solar energy plants. The facility, expected to be completed in 2020, produces is over 302 million kWh of electricity a year. After construction items are completed, in the next 10 years, Sao Mai Solar Power Plant will have a total generating capacity of 2.5 billion kWh a year. The plant covers ​​275 ha in An Hao commune - Tinh Bien district where solar radiation is highest and best. Electricity will be partially sold to EVN and distributed to thousands of households living in An Giang province and Cambodia. At the Vietnam International Agricultural Fair 2018 and the Vietnam - Japan Cultural Week at the Can Tho International Exhibition and Fair Center, the Mekong Chef 2018 was kicked off and competed by 14 finalist teams. 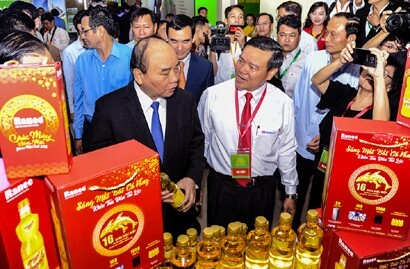 The Ranee premium cooking oil made by Sao Mai Group gives a message on billion-dollar pangasius of Vietnam. The “Vietnam Pangasius Festival” is the theme for this regional culinary event, funded by Ranee premium cooking oil. Ranee featured the new value of Vietnamese pangasius when it is used by famous professional chefs from prestigious hotel restaurants throughout the country. Sao Mai Group started the construction of Doi Tuc Dup revolutionary historical site in early 2019. The event was attended by over 600 delegates who are Vietnamese heroic mothers, former revolutionaries, incumbent provincial leaders, labor heroes, and local people. Mr. Le Thanh Thuan, Chairman and General Director of Sao Mai Group, said, Sao Mai Group and An Giang Tourism Company are determined to embellish, build and develop Doi Tuc Dup revolutionary historical site into an ideal tourism site and a growth engine for An Giang tourism. Also at this meaningful groundbreaking event, Sao Mai Group was honored to receive the Third Class Labor Order from the President of Vietnam for its business achievements and positive contributions to national construction and development.